Occupy Sandy has been an imperfect solution to the failed state, but criticism should be directed at absent government officials, not well-meaning activists. Superstorm Sandy destroyed large swaths of New York City’s Rockaway Peninsula last October, and in the storm’s wake, it immediately became clear that the traditional modes of relief (FEMA, the Red Cross) were performing inadequately, if the aid groups bothered to show up at all. In order to fill the vacuum, Occupy Wall Street activists quickly mobilized on the ground. At one point, Michael Premo, one of the volunteers, estimated the recovery effort included 2,500 volunteers, 15,000 meals and 120 carloads of supplies sent to recovery sites. But temporary charity is no match for permanent institutional structures, and Occupy Sandy was never meant to shoulder the burden of the failed state. Al Jazeera America reports that similar problems plague both OWS and Occupy Sandy, including a necessity to engage in politics in order to alleviate certain social ills like poverty, a process that is unappealing to many activists. In the wake of a tragedy like Hurricane Sandy, where thousands of poor New Yorkers were left without basic resources like electricity and water for many weeks—including many families that are still homeless—activists understandably have disdain for a government that seems determined to serve only an elite 1 percent (though the NYPD did manage to embed an undercover police officer with Occupy Sandy). However, such a mentality produces a talent vacuum. Bright, young activists avoid engaging with a power structure that badly needs reform, leaving the system to be savaged by corrupt players. “Unbeknownst to them and surely unintentionally, I think they’re kind of reinforcing a right-wing message that government isn’t the answer,” Joel Berg, executive director of the New York City Coalition Against Hunger said to AJA. Berg goes on to say Occupy’s social critique resonated with him, but any permanent reform will inherently involve engaging with politics. 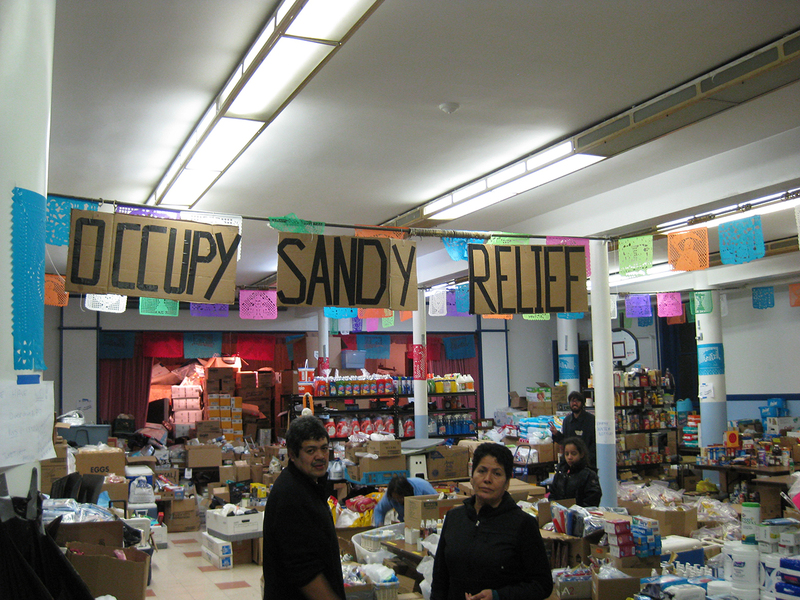 Some problems Occupy Sandy was never equipped (nor should activists have been expected) to solve. Diane Bourbon, a neighbor and mother who works night shifts at a convenience store, received a $10,000 Homeowner Resettlement Program grant from the state, which was aimed at keeping residents in place after Sandy and could not be used for construction or repair. But like others in her situation throughout New Jersey, Bourbon missed out on grants to repair her trailer or buy a new home—worth up to $150,000 and $50,000 respectively—because the vague language in state brochures and websites did not specify whether mobile home owners qualified, leaving many confused and discouraged from applying. As AJA notes, such problems are beyond Occupy Sandy’s abilities to tackle, and the mantle is instead being taken up by Janet Sharma, the executive director of the Volunteer Center, who coordinates the Bergen County response. Nathan Kleinman, from Occupy Philadelphia, says he considers Occupy’s main role now to be a “watchdog” over the state and nonprofit recovery work. Lisa Ewart, another Occupy activist, told AJA the problem is a lack of funds. “Without money, you can have the best intentions in the world, but nobody is going to stick around to volunteer,” Sharma said. But it would be a mistake to frame the Occupy Sandy story as a failure. Given the narrow mobilization window, limited recourses and labor pool consisting of volunteers who toiled for free, Occupy Sandy was a resounding success. In the early days of the recovery efforts, The New York Times, in addition to Mayor Bloomberg and the National Guard, all praised the group’s remarkable work. Any subsequent blame should be heaped upon a government that has focused the recovery effort only on bringing the power back to Wall Street. One year after the storm hit New York, more than 200 survivors are still without a home. These survivors live in shelters and rented rooms, and sometimes with friends, as many await to hear for the Bloomberg administration to approve two-year housing vouchers to help them pay for rent. Goldiner emphasizes that these are people who used to work hard for their incomes, but they lost everything in the storm. Corporation Counsel Michael Cardozo says the city cannot afford to single-handedly continue the program in the absence of FEMA funding. Juquetta Johnson, 40, worked a seasonal job as a parking attendant at the MCU Park, where the Brooklyn Cyclones play, and relied on public assistance. She lived in Coney Island with her daughters Shaquasa, 18, and Sequoia, 9, and son, Jahmarie, 7. But when the storm hit, they lost power in their building and in much of the neighborhood. Johnson told the New York Daily News they toughed out the freezing cold conditions and managed to remain in the building until she was evicted in January for not paying rent for three months. He refused to give her an extension, and even though Johnson had a FEMA voucher for a hotel, all the hotels were booked. She and her family wound up in a Brownsville shelter, which has a rule that if a family is gone more than forty-eight hours, they’re kicked out. In late April, Johnson and her children spent a couple nights at a friend’s house in Coney Island because her daughter Sequoia was taking the citywide reading and math exam and Johnson didn’t want her to be worn out by a long subway ride. Johnson told the Daily News she returned to the shelter with ten minutes to spare before the forty-eight-hour curfew only to discover the staffers had already thrown out her belongings. She also claims her pocketbook, with $1,000 cash for the tax return check she had just cashed, was gone, along with the family laptop, a Nintendo Wii game and the children’s birth certificates. A Department of Housing Services spokeswoman, Heather Janik, denies these charges. “There is no recovering from Sandy,” she said. Occupy Sandy shares a story about Roca Mia Construction Inc., a business that struggled to make ends meet between low-paying subcontracting gigs. Life got even tougher after Sandy because work was scare and businesses began to shut down across Far Rockaway. Occupy Sandy provided start-up funding and skill building assistance to the small business, and the men have since set up their own worker-owned cooperative. Allison Kilkenny has previously written about the evolution of Occupy Wall Street into numerous groups combatting various social problems.